I have gotten behind again, and I’m about to leave for Ireland (!! ), so I’m going to combine 2 drinks into one quick post. First up: Black Button Distilling. 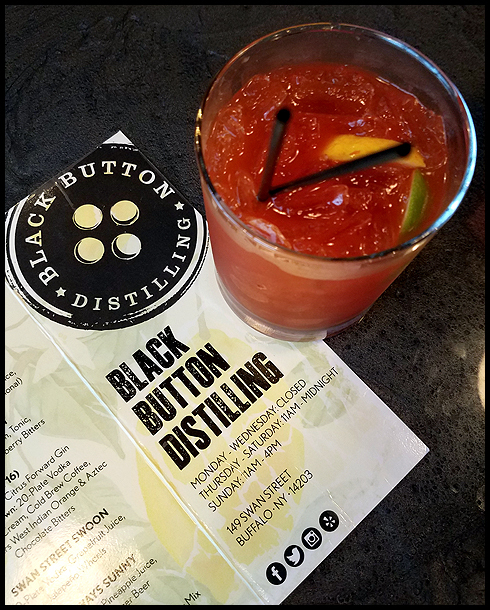 Another pub trivia night brought us to Black Button Distilling, which is based in Rochester NY, but has an “outpost” tasting bar in Buffalo. 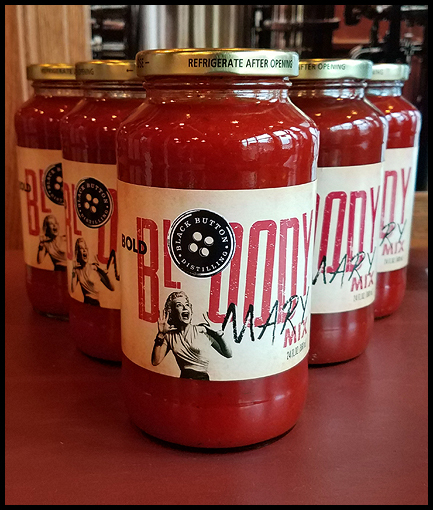 Upon walking in, I immediately saw their bottled Bold Bloody Mary mix for sale. I wasn’t going to order one, because I didn’t much feel like drinking, but I got one anyway. Using their 20 plate vodka and Bold mix, which was created from the owner’s Grandma’s recipe, this $9 cocktail was a bit sweet with a hint of horseradish. Garnished with lemon and lime, it had a decent amount of spice to it, but it had a flavor I didn’t love. I couldn’t put my finger on it. I drank it anyway, and decided to look at the ingredient list on the jar, and it turns out there are cucumbers in it. That must have been it! I can’t say it stood out strongly as cucumber but it just gave it a general flavor I didn’t care for. I’m sure it would be tasty to someone without such an aversion to cucumbers as I have. 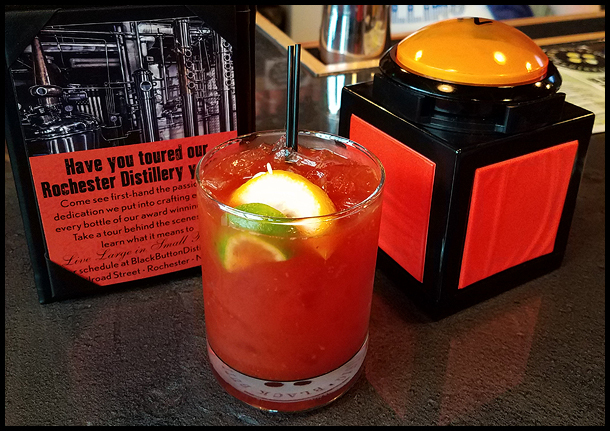 My Bloody with our buzzer. We did not do well. If you don’t have time for a cocktail, you can stop in and pick up a jar for $10. 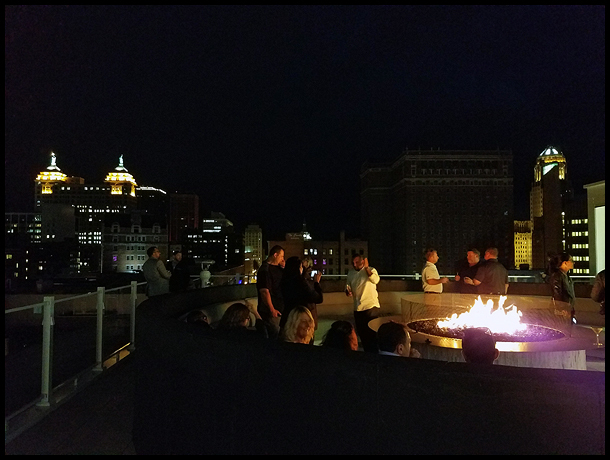 Up next is VUE, the roof top bar at the just opened Curtiss Hotel. The Curtiss Hotel is in a gorgeous old building that sat vacant for years. Located downtown, the bar has great views of City Hall, the Statler, the Liberty Building among others. VUE has 3 bars, and the nicest thing, is that there are roofed areas, that are still open and airy, so you can enjoy the lounge even if it was raining. There is a big fire pit as well as other heaters around for use throughout more of the year, though probably not once the snow starts flying. We approached the bar looking for a cocktail menu, but they didn’t have one…here is a fancy new bar with no cocktail menu? I know it’s a relatively new lounge, but even the simplest menu of classic cocktails would be something. They’ve been open all summer! That was a bit of a turn off, but they say one is coming. 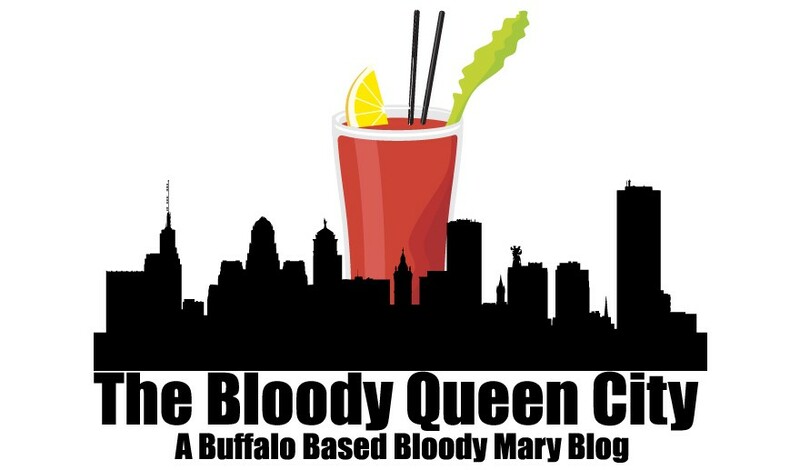 Since there was no menu, I wasn’t really in the mood for anything, so J just ordered me a bloody. And here is a bad photo. It’s hard to photograph a drink, at night, with a cell phone, on a light up bar. I’m not sure how much it cost, but our order of one bloody and one Basil Hayden’s on the rocks was $27. 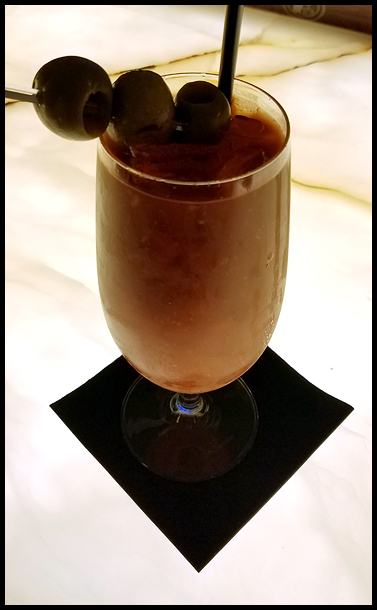 The drink itself was fairly decent, garnished with 3 olives, and no fruit. It was quite spicy, and very pickle-y, almost too much so. Sipping it caused a bit of mouth puckering haha. There was a lot of debris, including pepper and horseradish, but not so much that it wasn’t enjoyable. Definitely check out VUE, as it’s a great space to relax in, and get a bloody if you like, but I hope they come up with a cocktail menu soon so I can check out something else. I have one more review in the back log, which will have to wait until after Ireland. And hopefully when I return, I’ll have a bunch more to write up. Cheers!